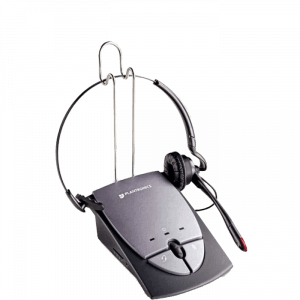 Corded Headset Systems - Headsets Direct, Inc. If you are in need of a headset for hands-free communication, but are unsure of exactly what you need, you may want to consider a complete system. Most business-grade headset solutions require a headset and bottom cable or amplifier. If you opt for a corded telephone headset system, you get everything you need, including the headset, amplifier, and necessary cables. By choosing a corded headset system, you are getting everything you need to make your headset life easy! The amplifier and headset are both included, along with the required cables, allowing you to simply plug into your phone and start talking, hands-free. Amplifiers are universally compatible with most phones and typically include speaker volume, microphone volume, compatibility settings, and microphone mute capability. Amplifiers will either come with an A/C power cord to plug into a wall outlet, or include standard AA batteries, which typically last for years. Higher-end wired systems will include a Quick Disconnect connection, allowing you to leave the headset on all day and simply pull the cables apart, putting your caller on hold as you walk away from your desk. As you compare pricing, less expensive systems will have average sound quality and average comfort, making for a more budget-friendly solution. More expensive models, those of business quality, will provide an extremely comfortable hands-free solution for all-day wearing and superb sound quality. As with most headset systems, you can easily plug two systems into a telephone for call monitoring and coaching.